A research team led by UCLA electrical engineers has developed an artificial composite material to control of higher-frequency electromagnetic waves, such as those in the terahertz and far-infrared frequencies. The material, specifically a metamaterial because it is has properties not found in nature, could be transformative for imaging, sensing and communication applications. It could be used for quality control in pharmaceutical production lines, scanning pills at high speeds to look for any defects; to spot cancerous tumors at early stages using tomography; or for forming adaptive high data-rate communication channels. "Terahertz frequencies in particular offer some unique advantages, for example they can 'see' some details not otherwise 'visible' in other parts of the spectrum," said Mona Jarrahi, an associate professor of electrical engineering at the UCLA Henry Samueli School of Engineering and Applied Science. "However their use is not widespread. Current systems require a mechanical scanning technique to steer or guide the focus area of the terahertz beam, much like a how an office copy machine uses a moving arm underneath the glass to capture an image." Despite extensive progress developing mechanical beam-steering techniques through miniaturization and the utilization of micro-electro mechanical systems, the potential use is still limited. Those tiny systems are complex with moving parts and for terahertz-based systems, they have not been practical. The team's solution is simple. "Our new metamaterial acts as a kind of moving lens that can focus on different areas of an object, but instead of being moved mechanically, its focus point is instead controlled electronically by changing an electric current that moves through it," Jarrahi said. "The material itself never moves." The material is made up of metal-coated vanadium dioxide on silicon and is punctured with cross-shaped openings. It would be placed in front of the radiation beam used in an imaging or sensing application. Depending on the level of electric current, the material can deflect the beam's focus point by as much as 44 degrees, both vertically and horizontally. 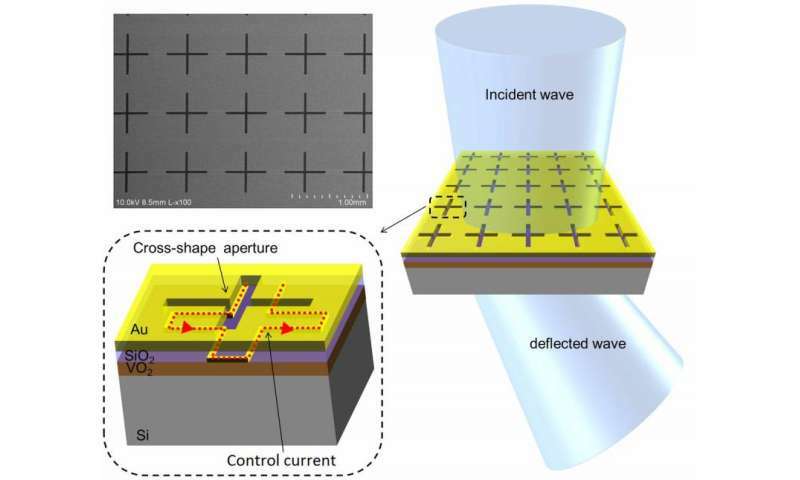 The new technology could lead to imaging, sensing and communication technologies in terahertz and far-infrared frequencies that are more reliable, compact, cost-effective and faster than the current state-of-the-art, the researchers said. The research paper has been published online in Nature Scientific Reports.